Hampton & Richmond Borough twice came from behind to earn a valuable 2-2 draw with high flying Sutton United at Gander Green Lane, a point which could be vital in their battle against relegation. This was always going to be a hard match for Mark Harper’s Hampton side, not least because top scorer Dave Tarpey was suspended. This left Harper short of options upfront, although the club did sign two new players a few hours before kick off. Adam Thomas, a striker signed from Chesham United, and midfielder Esmond James, who arrived from Conference South rivals Farnborough. Thomas was an unused substitute for the match, while James played around 75 minutes before being substituted. Back to the game then. After holding out for a draw against playoff chasing Tonbridge Angels in their last match, this trip to fifth placed Sutton was always going to be a stern test. Matters were not helped by a set of officials who were leaning towards the home side more often than not. An early example of this was the decision to disallow an early Hampton goal, when the referee adjudged Billy Jeffreys to have fouled the Sutton keeper while going in for a header. The decision was harsh to say the least, and another example that goalkeepers are far too protected these days. The home side were on top for most of the early stages, with the Hampton defence looking creaky under pressure. Several crosses and shots were blocked, and Beavers keeper Craig Ross pulled out a good save to deny the Sutton attack, although the assistant’s flag was raised for offside. On the quarter hour, Hampton’s creative midfielder James Simmonds turned well on the edge of the penalty area, but his curling effort went narrowly over. Joel Ledgister was leading the Sutton attack, having been on loan at Hampton before Christmas, and he proved to be a thorn in the Beavers’ side for the whole game. He opened the scoring on 24 minutes, lashing in a fine left foot effort, after he was denied just a few minutes earlier by Ross. Just before the half hour, there was a chance at both ends, as Charlie Moone, saw his shot blocked. Sutton countered, and Ledgister brought another save from Ross to deny the home side a two goal lead. A few minutes later, and Moone was given another good chance. Played in by Esmond James, he dragged his shot well wide, but two minutes later Moone was denied by a top save from U’s keeper Kevin Scriven. Moone met a throw in with a glancing header, which Scriven had to get right down to his right hand post to stop Borough levelling. The last couple of minutes of the first half were frantic. First, a scramble in the Sutton box saw an effort from Moone stopped by Scriven, but in the scramble, a Sutton defender fell to the ground and definitely used his hands to stop the ball. Neither the referee or his assistant, who would have had a very good view, gave the decision, much to the derision of the travelling supporters behind the goal. Buoyed by this, United peppered Borough’s penalty area in the last seconds of the half. Hampton defenders were throwing themselves in front of shots and crosses in an effort to keep the scoreline down. 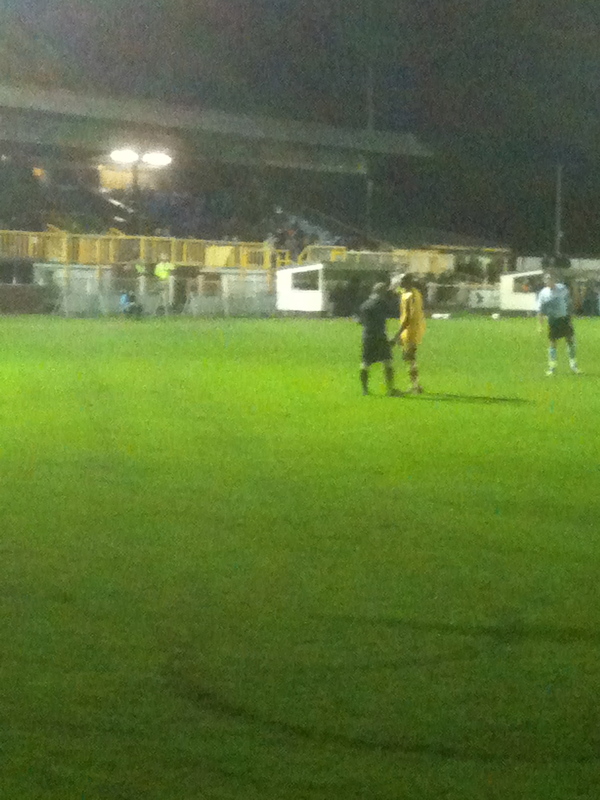 It worked, and at half time the score was Sutton United 1 Hampton & Richmond Borough 0. Right back Lewis Ferrell was substituted for Tom Hickey seconds from the end of the first half, and he told me on twitter that he was suffering from flu. Get well before Saturday Lewis! Unfortunately, Hampton couldn’t make the extra man count, and it was the home side who regained the lead on 65 minutes. Ledgister scored his second after the Beavers defence failed to deal with a free kick. To be fair, though, the visitors kept their belief and were rewarded six minutes later. O’Donnell drilled a cross into the six yard box, and Moone got a touch to it to turn it in, and get the goal he deserved for his efforts. With fifteen minutes left, Esmond James was substituted, ending his very promising debut. He was replaced by Louie Rae Beadle, who had dropped out of the starting eleven to make room for James. It almost proved to be a masterstroke, as Beadle had the last chance of the match, in the last minute. O’Donnell put in one of his brilliant corners, and Beadle met it at the far post, only to see his header narrowly miss the top corner. That was the last notable action and the game finished 2-2. Overall, this was a very enjoyable and entertaining match, which was end to end at times. My overrinding thought, though, is that Hampton might have come away with the points if Tarpey had been in the lineup. I just think he would have put away more of the chances that fell to Moone. Hampton’s next match is a tricky trip to East Thurrock United in the FA Trophy Second Round. East Thurrock are on a great run of form, winning their last six matches. They haven’t lost since December 3rd, so Harper’s boys will have to be on top form for the match. Hampton & Richmond Borough: Ross, Ferrell (Hickey 45), O’Donnell, Jeffreys, Ruby(c), Andrews, Collier, Huggins, Moone, Simmonds, James (Beadle 75). Subs not used: Thomas, Morgan, Sousa-Mota. Posted on January 11, 2012, in UTL Archive and tagged Charlie Moone, Craig Ross, Hampton & Richmond Borough, James Simmonds, JJ O'Donnell, Joel Ledgister, Mark Harper, Sutton United, Vanarama NL South. Bookmark the permalink. 1 Comment.